To celebrate the upcoming release of Downside Rain, I’d like to give away some swag. None of it is book-related, but is FUN stuff! There will be two giveaways. Local friends call me Queenie. Why? I’m an Englishwoman, a fan of the British Royal Family, and I still have my English accent despite living in the US for many years. So, Giveaway #1 is Queen themed. 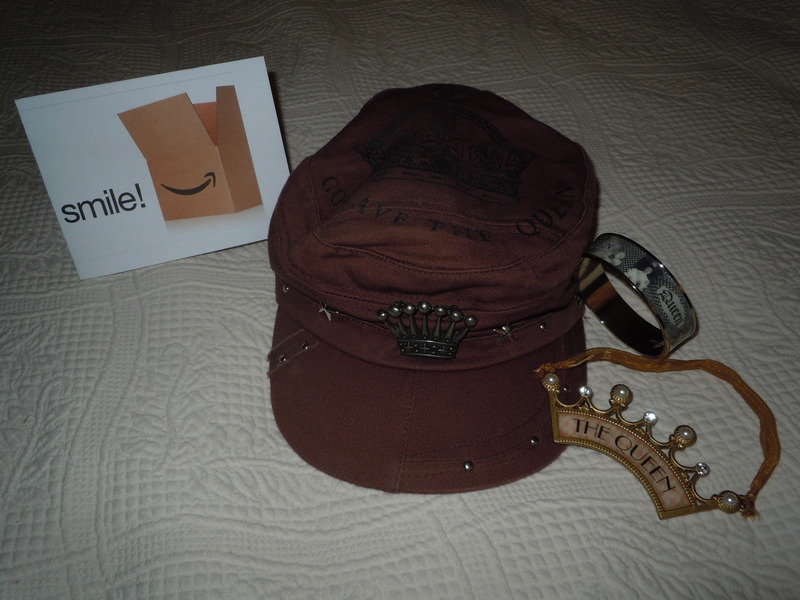 You’ll win a brown, baseball-style hat fit for a Queen, a cute “Queen” hanging sign to let everyone know you’re in charge, a lovely bangle-style bracelet and a $25 Amazon gift card to be used for anything in the Amazon store. How to enter? Go to my Facebook page Linda Welch Writing and “Like” it, if you haven’t already. Leave a comment on the Giveaway #1 post. You can just say hi, hello, g’day – anything you want to. The new Facebook Rafflecopter app will choose a winner. This Giveaway will run from today September 12th thru September 19th. If you’d like your friends and family to have the opportunity to enter, please spread the word! This entry was posted in Stand Alone and tagged Downside Rain, Facebook, Free, Gveaway, Linda Welch, Linda Welch Writes, Rafflecopter, Swag. Bookmark the permalink. I’m looking forward to the release of Downside Rain, Ma’am. I’m just off to walk the corgis. What time will you be requiring tea ? Milk and 4 lumps, please. Four? Ma’am, may I humbly suggest that four lumps will not be beneficial to the Royal figure, or the Royal gnashers.